COLLEGE PARK, Md. — Following a victory over Minnesota and a refreshing week off, Maryland is poised to take its initial plunge into the Big Ten East. It’s been difficult to get a read on the Terrapins, who for the most part have been surprisingly good while operating under difficult circumstances. The team has dedicated the season to offensive lineman Jordan McNair, who collapsed on the field in May and died of heatstroke two weeks later. In the wake of his death, coach DJ Durkin was placed on administrative leave while an independent investigation of the culture of the program is being conducted. Canada, the team’s offensive coordinator, took over despite never serving as a head coach. In his debut, Maryland pulled off an upset of then-No. 23 Texas. After rolling past Bowling Green, the Terrapins inexplicably were manhandled by Temple at home before bouncing back to crush Minnesota 42-13. So, perhaps Maryland’s performance against Michigan (4-1, 2-0) will reveal where the Terps stand among the traditional powers in the Big Ten East. Maryland is only 1-4 at the Big House, including a 59-3 bashing in 2016. 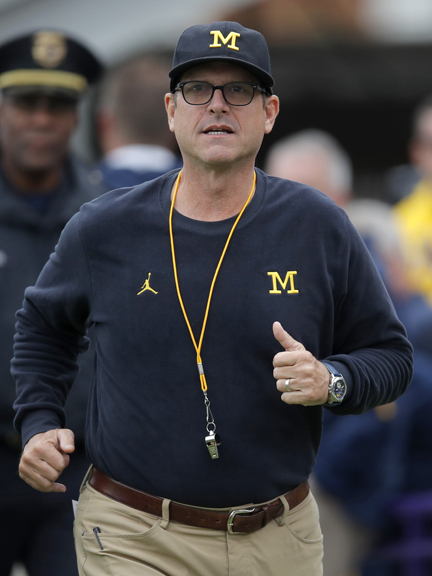 Someone asked Canada about his feelings on being a head coach and matching wits with Wolverines coach Jim Harbaugh.